In this test, the students are tested for their knowledge in basic structure and vocabulary and their skills in listening and reading comprehension. The test lasts for approximately 2 hours. Who can take the Preliminary Test of English? The test is held for the newly-registered students at our university. When is the Preliminary Test of English held? The test is held once a year every September. Up-to-date information related to the date and exact time of the test can be reached from our academic calendar and from our website. Where is the Preliminary Test of English held? The test is held at UTAA Türkkuşu Campus. You can reach the updated information about the location of the test from our website. What is the passing score for the Preliminary Test of English? The students who get 70 or above qualify to take Stage II (Writing Exam, Speaking Exam and Multiple-Choice Test) of the Proficiency Exam. What happens if I fail the Preliminary Test of English? Students who do not take the test or students who get 45 or below are placed in Alpha (Beginner) level of our English Prep Program and they attend classes in the same level throughout an academic year. If the Department of Foreign Languages considers appropriate, the level of the students who have not taken the test might be changed within the first month starting from the day the program starts. Students who get 46-69 are placed in Bravo (Pre-Intermediate) level of our English Prep Program and they attend classes in the same level throughout an academic year. If I miss the Preliminary Test of English for any reason, can I take a make-up test? 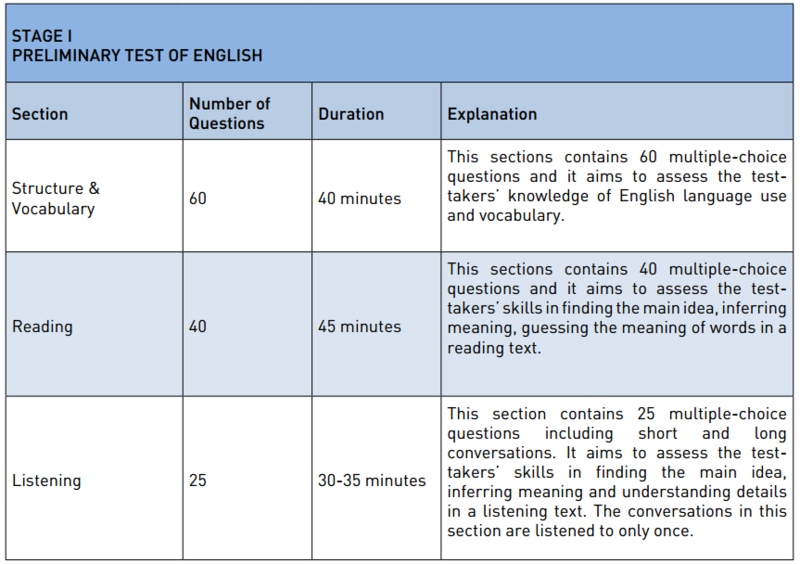 How can I learn my Preliminary Test of English score? The information regarding your score can be reached from our website. Test scores are not announced via email, fax or telephone calls. What rules should I follow in the Preliminary Test of English? Check the information about the test date, place and the test room on our website before you take the test. Make sure you have a valid identification card (National ID card or driver’s license), a pencil, a pen and an eraser with you on the test day. Arrive at the test venue at least 10 minutes prior to the commencement of the test. Once the test starts, no students will be allowed in. Students must comply with the proctor’s instructions at all times. The test of the students who do not follow the proctor’s instructions and/or who attempt to cheat and/or impersonate the rightful test-takers will be considered invalid and these students will be subject to disciplinary action. How can I access a sample Preliminary Test of English? You can access the sample Preliminary Test of English and the answer key by clicking on the links below. Is it possible to access a sample answer sheet? You can access the sample answer sheet for the Preliminary Test of English by clicking on the link below.